Every spring, the annual New Tricks Literary Magazine is released as a showcase of works provided by the faculty, staff, and students of Dakota State University. 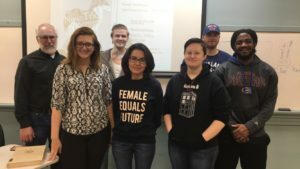 English for New Media Publishing students have been working for two months to put the literary magazine together in time for the launch, which is happening on Thurs, Apr 19 at the Karl E. Mundt Library. 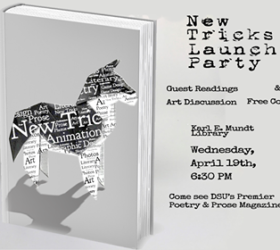 A Launch Party will begin at 6:30 and feature the release of New Tricks as well as many contributors reading and displaying their featured work. This includes the reciting poetry and prose and speaking about artwork/photography. Contributors attending the party will be put in a raffle to win some fantastic prizes. While the raffle is only for guest speakers, anyone and everyone is invited to come to the Launch Party.